Download Whitepaper on "Testing ATAs, Gateways, VoIP PBXs, and other Signal Processing Elements in VoIP Networks"
Message Automation & Protocol Simulation (MAPS™) is a protocol simulation and conformance test tool that can be applied to a variety of protocols such as MGCP, SIP, MEGACO, SS7, SIGTRAN, ISDN, GSM, UMTS and others. Almost all MAPS™ IP based simulation products supports FAX over IP (FoIP) simulation supporting both the types- RTP G.711 Pass Through Fax Simulation (PKS200) and T.38 Fax Simulation over UDPTL (PKS211). MAPS™ SIP can simulate User Agents (User Agent Client- UAC, User Agent Server-UAS), Proxy, Redirect, Registrar, Registrant servers and any interface in a SIP network. Supports transmission and detection of various RTP traffic such as digits, voice file, single tone, dual tones, IVR, FAX*, Video*, and Instant Messaging (MSRP)*. (* requires additional licenses). MAPS™ SIP IMS test suite is capable of simulating multiple UEs and IMS core elements. 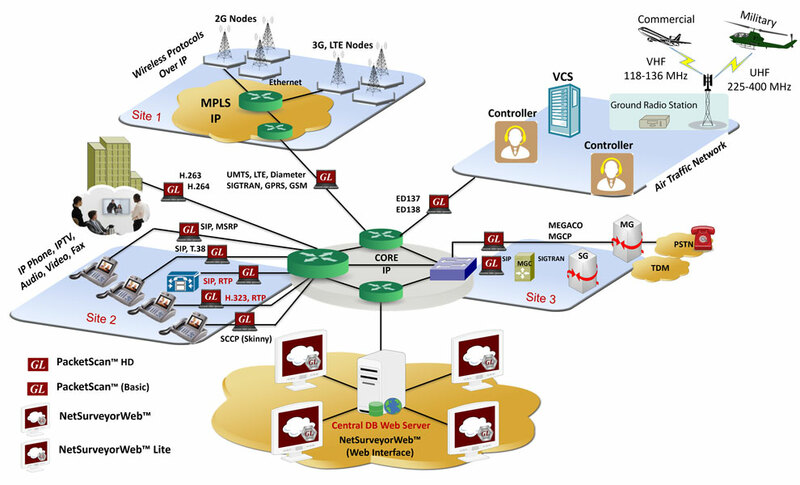 With the help of mobile phones, and other simulated wireless networks, the VoLTE Lab setup can be setup in real-time for making VoLTE calls and also for interworking with PSTN and VoIP networks. 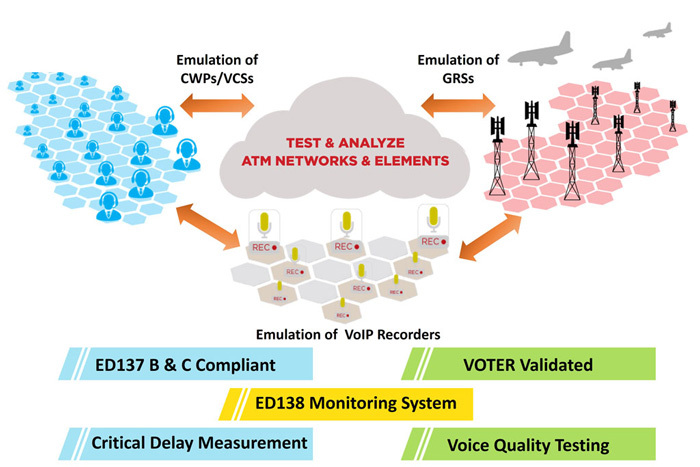 MAPS™ ED-137 Radio can simulate Air-to-Ground calls per EUROCAE standards (ED-137/1C, ED137/1B) to perform functionality and performance testing of network elements within VoIP ATM core network. The simulator provides ability to customize the call parameters for simulating different call scenarios between Controller Working Positions (CWPs), Ground Radio Station (GRS) or Radio Media Gateways (RMG). Hundreds of CWPs/Radios can be simulated to perform functionality and load testing of the ATM network. MAPS™ ED-137 Telephone can simulate bulk Ground-to-Ground calls per EUROCAE standards (ED-137/2B). The simulator provides ability to customize the call parameters for testing different call scenarios between Controller Working Positions (CWPs) across VoIP ATM network. Hundreds of CWPs can be simulated. Supported call types include- Instantaneous Access (IA), Priority Direct/Indirect Access (DA/IDA), Routine Tactical Direct/Indirect Access, Routine Strategic Direct/Indirect Access, Routine General Purpose Direct/Indirect Access, Position Monitoring Call (Combined A/G and G/G, A/G only, and G/G only). MAPS™ ED137 Recorder can simulate Recorder interface for both Air-to-Ground (AG) and Ground-to-Ground (GG) calls at Controller Working Position (CWP), Ground Radio Station (GRS) and Recorder endpoints as per ED-137/4B, as defined under EUROCAE (European Organization for Civil Aviation Equipment) Working Group 67. MAPS™ ED137 Recorder can also simulate AG/GG call recording towards Recorder and testing Recorder interface of CWP/VCS and GRS. MAPS™ is an ideal tool to evaluate Gateway / ATA with TDM and VoIP Interfaces. The tester supports T1 E1 PRI ISDN, Megaco, and SIP interfaces. Product features include call connectivity, call signaling, traffic generation, voice quality testing, codec, and hundreds of other features. For more details, contact GL Communications. 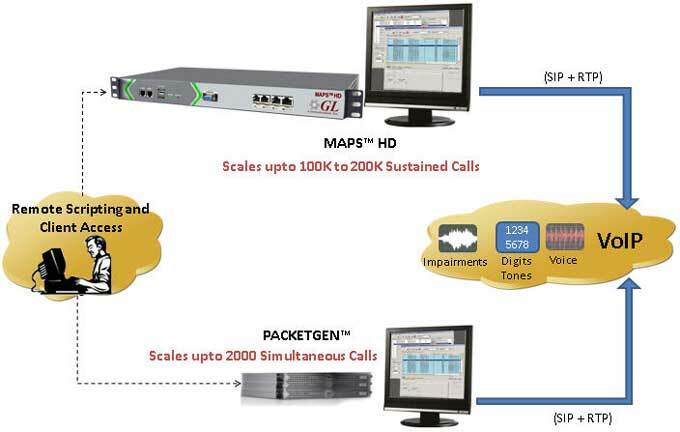 MAPS™ HD is a High Density version of MAPS™ and a special purpose 1U network appliance that is capable high call intensity (hundreds of calls/sec) and high volume of sustained calls (tens of thousands of simultaneous calls/1U platform). MAPS™ HD network appliance is designed to easily achieve 4 to 20,000 endpoints per 1U server. Using a stack of multiple servers, a larger test system with 100K-200K calls (all controlled from a single Master Controller) is achievable for enterprise to carrier grade testing. PacketGen™ is a PC-based real-time VoIP bulk call generator for stress testing and precise analysis of the VoIP network equipment. PacketGen™ is based on a distributed architecture, wherein SIP and RTP software cores can be modularly stacked in one or many PCs to create a scalable high capacity test system. An optional hardware RTP can support 120 real-time voice calls from real phones, or fax calls from fax machines. 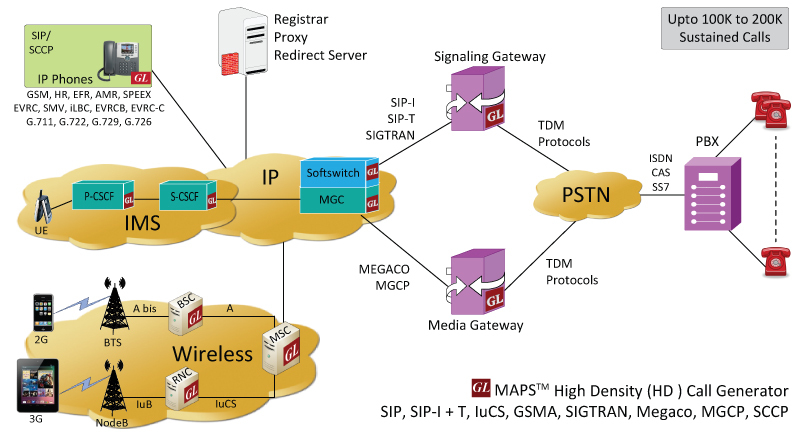 Distributed architecture for GUI, SIP and RTP systems provides high call rates and media streams. This also makes it scalable & easy to add additional load generation capacity. Full SIP Functionality - Registration, Call Forwarding, Call Hold, Call Transfer, Authentication, etc. Testing and developing enhanced voice features (VAD, Echo Cancellation, Codec, Digit Regeneration, Digit Generation, Jitter Implementation and more) within end-user equipment (IP Phones, ATA, MTA and more). GL’s RTP Core allows creating, managing and deleting RTP sessions. RTP Core is a standalone application that acts as an interface between RTP Dll and the application. RTP Dll uses RTP protocol to carry the media streams including real-time audio, voice files, DTMF/MF digits, tones, IVR, FAX, impairments, and loopback traffic over created sessions. RTCP is used to monitor transmission statistics and quality of service (QoS). Different RTCP packets are also generated at random intervals carrying all control information about the session. With additional licenses, RTP Traffic Generator can support RTP traffic implementation over Iu-UP (Iu User Plane Interface) layer of the UMTS IuCs Network and also support RTP traffic as per ED-137B of EUROCAE standards used for voice communication in Air Traffic Control networks. RTP core can simulate bulk voice traffic using pre-recorded Voice Files in wave, pcm, and GL's proprietary pre-compressed GLW files with a synchronous Tx/Rx option over IP networks. Bulk Video Call Simulation capability, possible to generate more than 500 simultaneous video calls using its pre-recorded video traces supporting codecs like H.264, H.263 etc. RTP Fax Simulator is capable of bulk fax calls over IP in T.38 pass through mode (using G.711 PCMU and PCMA). It can transmit pre-recorded Tiff image to DUT (Real-time Fax machine), receive Pass-Through fax from DUT. 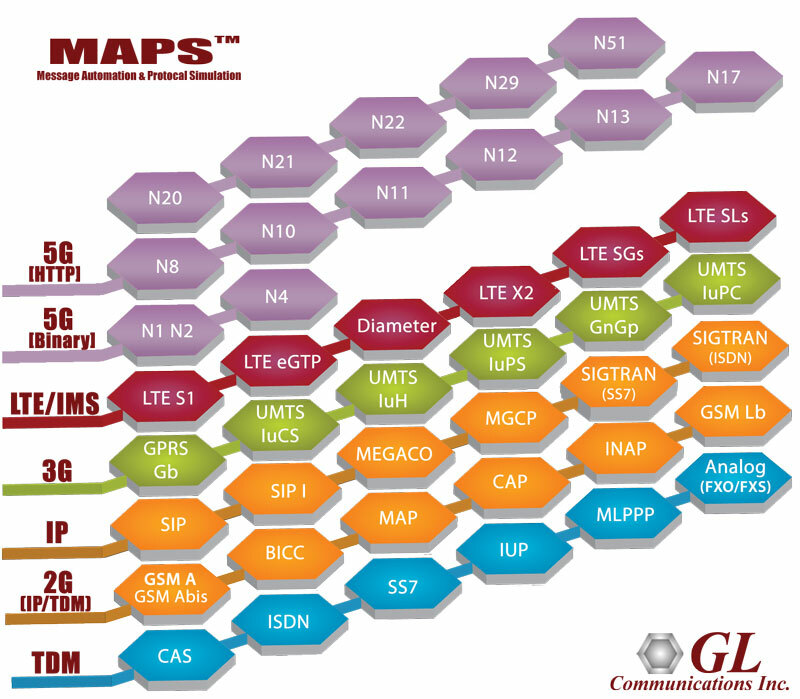 High Volume Mobile Data Traffic Generation - GTP Traffic Simulation modules within MAPS™ supports user-plane traffic simulation in LTE, UMTS, and GPRS networks. GTP, or GPRS Tunnelling Protocol are the methods for sending IP traffic in Wireless Networks such as GPRS, UMTS, and LTE. 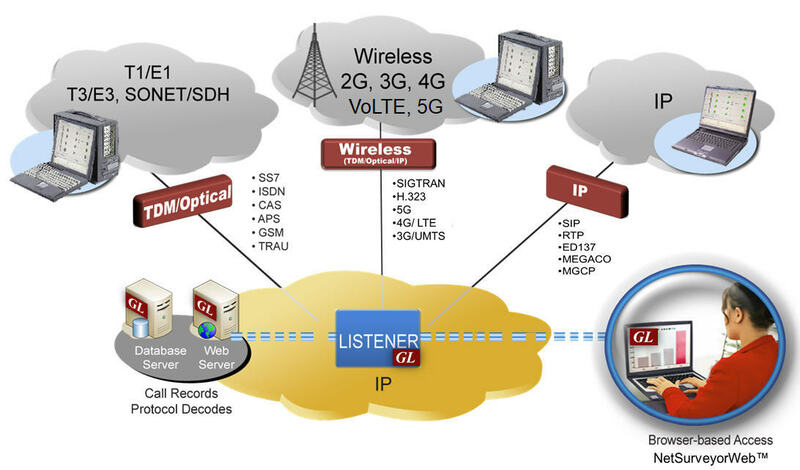 GL’s mobile test solution provides the capability of connecting to and between any network, any service, and any interface for testing voice and data quality. Various associated applications (Voice Quality, Video Quality, Data tests, Echo and Delay tests, Fax tests, VBA) works with VQuad™to provide "end-to-end assessment" with additional test and measuring capabilities. Perform automated tests including TCP, UDP, HTTP, VoIP, Route, FTP, DNS, SMS, Email, PhoneInfo, SimInfo, and UEInfo tests. Typical networks supported includes Wireless (WiFi, Bluetooth®, 3G, 4G, LTE), Broadband Internet (3G, 4G), VoIP SIP, PSTN, and TDM. GL provides several tools to thoroughly test VoiP ATAs - PacketGen, PacketScan, RTP Toolbox are some of the tools. The analog telephone adapter (ATA) permits consumers to easily utilize the broadband services for VoIP with a conventional landline. It has lot of advantages as it preserves the existing infrastructure (phones, wiring, jacks etc). These ATA's are totaly inexpensive and portable and also they provide very easy number mobility. The VoIP phones and ATA's must be free of noise and other hindrances that may cause a degraded voice quality when using this equipment. GL's VQuad™ w/ FXO Analog option and/or VoIP option, along with Voice Quality Testing (VQT), provides the complete automated network testing solution including four analog 2-wire interfaces (RJ-11), up to 12 SIP User Agents and the voice quality measurement and analysis tools. 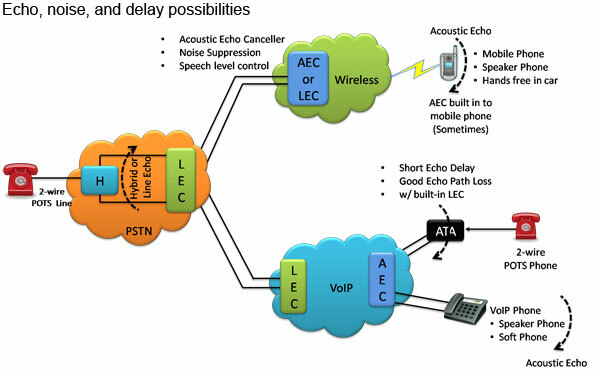 Providing clear, uninterrupted voice is critical in Network and Echo Cancellation development. 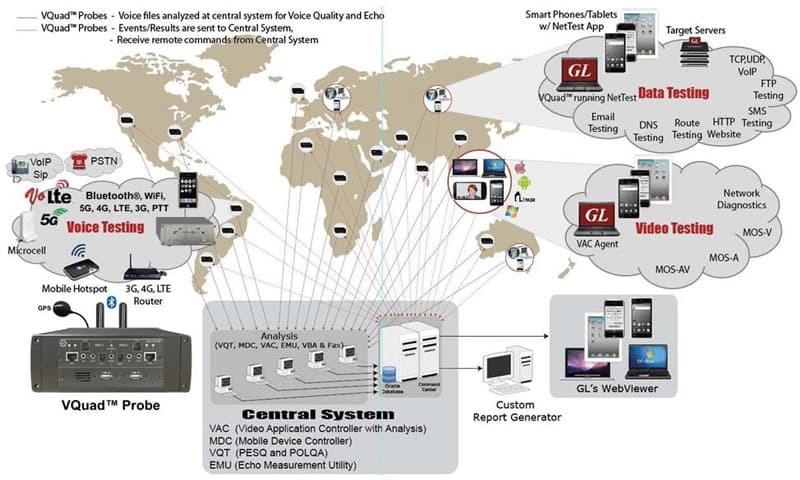 GL's Voice Quality Testing (VQT), accessed through an easy to use GUI interface, along with the many supported platforms for transporting voice, provides the voice quality measurement and analysis tools for all types of networks carrying voice traffic. The DCOSS MG (Media Gateway) system supports dual redundant Ethernet trunks for traffic and signaling testing of VoIP and IP networks. The DCOSS / MG combination provides user friendly bulk call generation and reception for various voiceband traffic types including voice, fax, and modem. It can be connected to any IP Phone, softphone, VoIP PBX, or VoIP Network / Cloud. GL offers high density Ethernet/IP tester variant which includes mTOP™ 1U/2U rack mount enclosures within which PacketExpert™ portable USB units are stacked to provide high density GigE ports form factor solution for testing GigE switches, routers and network conditions. Multiple USB portable hardware units can be easily placed in a mTOP™ 1U/2U rack mount enclosure (MT001, MT002, MT003, MT004) to provide high density GigE ports solution. PacketExpert™10GX (PXN100) a multi-functional ethernet tester which includes 2x 10/1 Gbps Optical ports, and 2x 10/100/1000 Mbps Electrical or 100/1000 Mbps Optical capable ports. The 10 Gbps Optical ports can be down-shifted to support 1Gbps Electrical ports, thus offering 4 Electrical / 4 Optical 1 Gbps ports for ethernet testing. Additional PXN101 license is required to test using 10Gbps optical ports. The PacketExpert™ 10GX hardware is more compact with reduced power requirements for high performance and adds 12-port user-configurable TTL trigger option as an important enhancement. 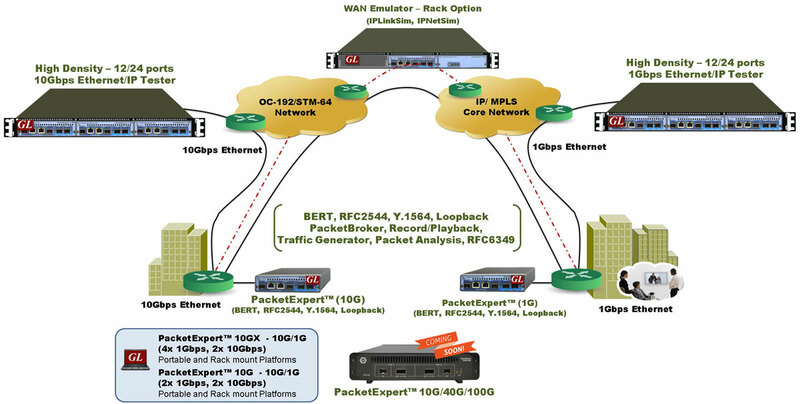 BERT and Smart Loopback features are supported across all available ports. Other additional functionalities include -Y.1564, IP WAN Emulation, Record/Playback, PacketBroker, Multi-stream Traffic Generator and Analyzer, RFC 6349. 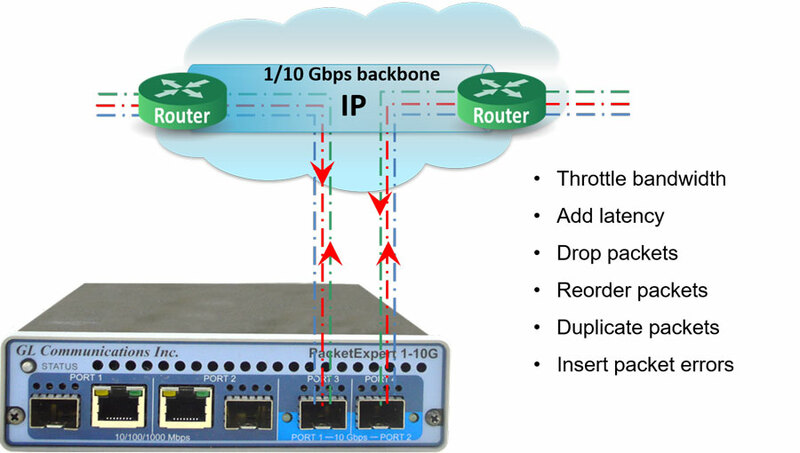 PacketExpert™ 10G (PXG100) product that provides comprehensive testing of 10G Ethernet/IP networks. The hardware interface is limited to 2x 10/100/1000 Mbps Electrical or 100/1000Mbps Optical ports and 2x 10G Optical only ports, supporting functionalities same as listed above. Touchscreen Handheld PacketExpert™ 10G (Coming soon) version of 10G Ethernet/IP Tester (PXG101), with a Tablet PC mounted on PacketExpert™ 10G, which makes this tester suitable for field testing. PacketExpert™ 1G (PXE100) is a Portable Quad Port Ethernet Tester (USB based) with 4x 10/100/1000 Mbps Electrical ports and 2x 1G Optical Ports. The portable Ethernet/IP tester connects to Notebook PC through a USB 2.0 interface. GL’s PacketExpert™ - Ethernet / IP Tester includes an optional ExpertSAM™ application intended for multiservice testing to measure the maximum performance of the Device or the Network Under Test. ExpertSAM™ is a set of procedures that test the ability of Ethernet-based services to carry a variety of traffic (voice, data, and video) at defined performance levels. In particular, it is aimed at addressing limitations of legacy RFC 2544 test procedures, especially for Service Level Agreements (SLA). ExpertSAM™ is a single test conducted to validate SLAs as per ITU-T Y.1564 standard. The ITU-T Y.1564 is built around two key subtests, the Service Configuration Test and the Service Performance Test. Record and Playback is an optional application within PacketExpert™, which is used to transmit and / or capture packets at wirespeed over network. Record and Playback feature is available in various operating modes such as Record Only mode, Playback Only mode, Record and Playback mode, and Record and Playback (per port) mode. 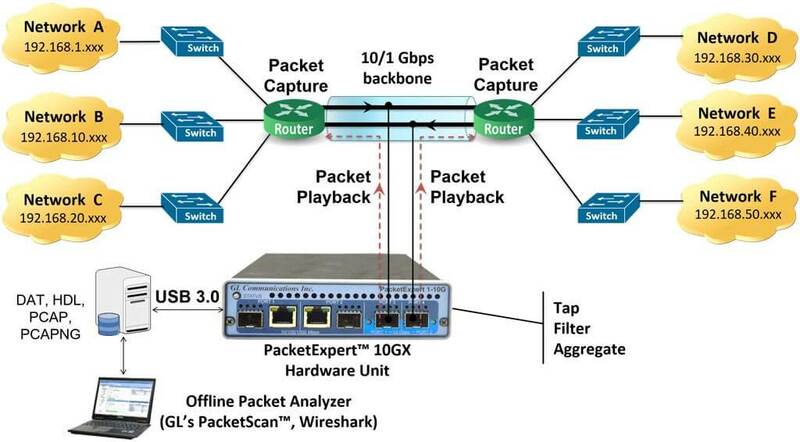 PacketBroker™ is an optional application added to GL’s PacketExpert™ platforms that allows the Ethernet test tool to be used as a highly precise non-intrusive Wirespeed Ethernet Tap with all the necessary features such as Pass through Tap, Hardware Filtering, Packet Modification and Output aggregation. Multi Stream UDP/TCP Traffic Generator and Analyzer is an optional application on PacketExpert™, which is capable of generating multi-stream Ethernet traffic of varying packet length and also analyze the loopback traffic. It has the capability to Generate and Analyze up to 16 UDP streams of traffic of various packet lengths. This tool finds itself especially useful for end-to-end testing of 1 Gbps and 10 Gbps WAN (Wide Area Network) links. ExpertTCP™ is an optional application on PacketExpert™, the test methodology of which is based on the RFC 6349 to measure TCP throughput, RTT and optimal window size. It has the capability to Generate and Analyze up to 12 UDP streams of traffic of various packet lengths. It can also perform bi-directional TCP throughput measurements in combination with another unit configured at the remote location (other end of the network). ExpertTCP™ supports both Upstream (Client → Server) and Downstream (Server → Client) direction testing. GL's PacketCheck™ is a PC based Ethernet test tool that is designed to check frame transport ability, and throughput parameters of Ethernet and IP networks. It can be used as a general purpose Ethernet performance analysis for 10Mbps, 100Mbps and 1Gbps Ethernet local area networks. The PacketCheck™ makes use of the network interface card (NIC) in the PC to transmit and receive Ethernet packets over the network. Throughput up to 800 Mbps can be easily tested. PacketScan™ (PKV100) - an All-IP Network Monitoring software offers powerful features to capture and monitor live signaling and traffic over IP (version 4 and 6). It captures, segregates, monitors and collects statistics on all IP calls.Supports decoding of almost all industry standard signaling protocols – See Protocol List for more details. Users can perform a host of activities on the captured calls, allowing you to get an exact picture of QOS (quality of the service) and the technical adherence (adherence to the protocols specified by the standardizing authority) of the system under test. It allows users to listen/record VoIP calls in real-time; perform power, frequency, spectral, tone and digit analysis with ease and precision. It's ability to monitor / record audio and video data of a session to files (in QuickTime *.qt format), allows users to perform powerful video analysis. The captured VoIP calls with video can be played back using 3rd party VLC Viewer application. Detailed call statistics such as packet loss, gap, jitter, delay, RTP performance statistics, and unparalleled voice band statistics can be monitored simultaneously. GL also provides PacketScan™ HD (PKV120) for High Density IP Traffic Analysis w/ 4x1GigE Network Monitoring and PacketScan™ FB (PKV121), a File Based IP Traffic Analyzer Server for near real-time processing of traces. Packet Data Analysis (PDA) is an outstanding tool for live monitoring of signaling and traffic over IP. Packet Data Analysis (PDA) is distributed with GL’s Packet Analyzers, allowing users to monitor live IP networks including capture, analysis, and reporting of every call in detail. Supported protocols include SIP, MEGACO, MGCP, H.323, SCCP, RANAP (UMTS IuCS), and GSM A. It can capture IP packets over different transmission lines, including IP, T1, E1, T3, E3, and OC-3 STM-1 / OC-12 STM-4. PDA then processes the captured packets, identifies, and segregates calls based on signaling and traffic parameters. NetSurveyorWeb™ remotely works with PacketScan™, a central web server and database to facilitate result display using web-based clients. Users can view real-time data, navigate through records, filter the collected VoIP traffic summary, and graphically analyze the call volume, MOS, call completion, failed calls, completed calls, PDD, and more through a simple web browser. NetSurveyorWeb™ Lite is an integrated and simplified web-based system distributed across IP/ Wireless networks at probe level. It is a simple plug-and-play system with Web Server Database Engine + Protocol Analyzers on a single system, offering historical data retention up to 9 GB. GL's PacketProbe™ is an advanced embedded VoIP monitoring software. The PacketProbe™ passively monitors VoIP traffic carried over LAN or WAN by producing real-time per call and per-stream voice quality metrics. Call Detailed Records (CDR) along with voice quality including Mean Opinion Score (MOS) and other vital diagnostic information provide network managers immediate visibility into service quality, call volume, and call details. Service providers should be able to rapidly drill down and diagnose voice quality problems. 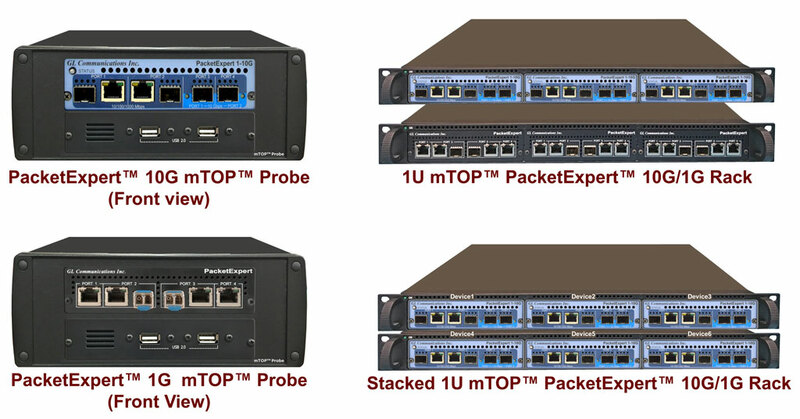 PacketProbe™ software can be used as an embedded application or as standalone probe appliance. Multiple PacketProbes™ can provide network wide voice quality visibility through GL’s NetSurveyorWeb™ or other NMS systems. 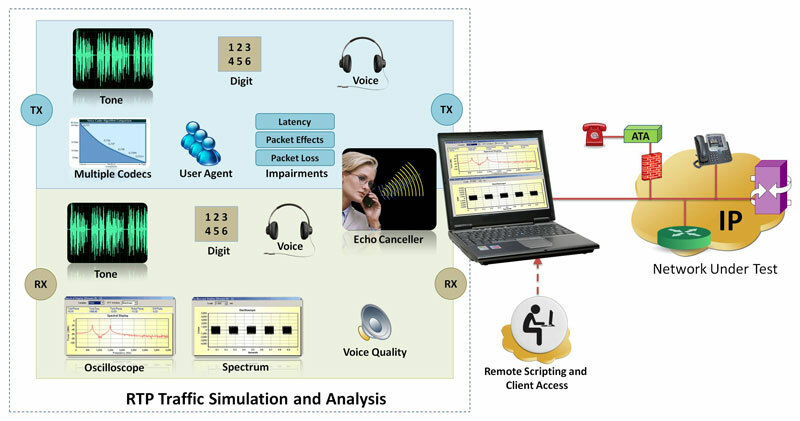 The Near Real-time Voice-band Analyzer (VBA) is an analysis tool for monitoring voice band network traffic. The VBA can host different analysis modules for monitoring speech and noise levels, and line echo. The standard modules included in the application are ITU-T P.56 Active Voice Level analysis, Line Echo (Hybrid) analysis, and Acoustic Echo analysis. Other analysis modules such as ITU-T P.561, P.562, and P.563 can be hosted as plug-ins. VBA is enhanced with optional FaxScan™ module, which can be used to analyze voiceband captures for Fax traffic and output fax signaling frames in a log file and fax image in TIFF format. GLInsight™ with FAX for IP is a powerful and feature rich offline software tool that analyzes pre-recorded IP fax calls. GLInsight™ with MODEM for IP analyzes modem traffic recordings within IP packets, by depacketization of the PCM signal, appropriate signal analysis, demodulation, phase analysis, error correction and data decompression. IPNetSim™ is an optional application on PacketExpert™ platforms, which emulates an IP network with access to 10 Gbps full duplex link or a 10/100/1000 Mbps full duplex link. For each direction, incoming traffic can be identified into separate user defined streams (up to 16 streams for 1 Gbps pipe and up to 4 streams for 10 Gbps pipe). These user defined streams can be modified to simulate network impairments. All the conditions encountered in a real-time IP network are simulated such as network latency, network delay variation (jitter), bandwidth, congestion, packet reordering, packet duplication, packet errors, bit errors and other link impairments independently in both directions at speeds of up to 1000 Mbps and up to 10Gbps links . It can be used to test IP end point devices (Gateways, IADs, IP phones, Soft phones, and so on) for voice, fax, data, or multimedia transmission over IP. IPLinkSim™ is an optional application on PacketExpert™ platforms, which can simulate a single bi-directional link between any two active ports. 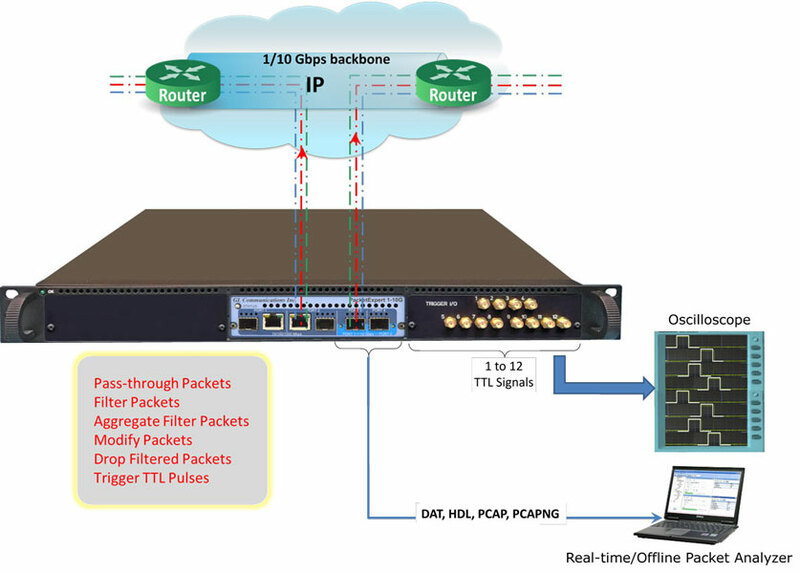 All the conditions encountered in a real-time IP network can be simulated such as network latency, network delay variation (jitter), bandwidth, congestion, packet reordering, packet duplication, packet errors, bit errors and other link impairments independently in both directions at speeds of up to 1000 Mbps and 10Gbps links. WAN Link Emulation is provided essentially by bandwidth control within IPLinkSim™, which mimics slower WAN links like RS232/DSL/Modem/T1/E1/T3/E3 etc. IPLinkSim™ can be used to test performance of applications that uses Ethernet /IP based transport such as Web Services, Database access, enterprise networks, storage, VoIP services, and so on. IPNetSim™ Handheld device is a hand-held battery operated instrument that can simulate the real-time IP and Carrier Ethernet network dynamics by means of hardware controlled packet delay, loss, jitter, errors, bandwidth limitations, congestion, and duplication. IPNetSim™ Handheld offers to manage network behaviours of up to 1 Gbps rates with accuracy always better than 1ms. IPNetSim™ Handheld is equipped with hardware based impairments generator, and dual GbE ports.